I cannot believe that November is here. This year went by so fast, it came with so many ups and downs. We will get into that topic in a whole other blog post. Today’s blog post is going to be short and sweet. I wanted to share my cute OOTD for the fall weather. It’s officially time to bust out the booties. Ugh, I can’t get over this look. The boots are from Charlotte Russe, my jeans are from Torrid, and my top is from Lane Bryant. Did I mention that I have officially went down an entire pants size? Yea, that’s right! What is your favorite fall item? You guys seem to love when I rock Charlotte Russe Plus, so here you go! From head to toe featuring Charlotte Russe. The Perfect New Years Eve Party Dress! Hello you gorgeous person, I hope that you are here to get inspired. Today I am bringing to you a fashion post! I am seriously in love with this dress!! As soon as I laid my eyes on it, I knew that I had to have it. 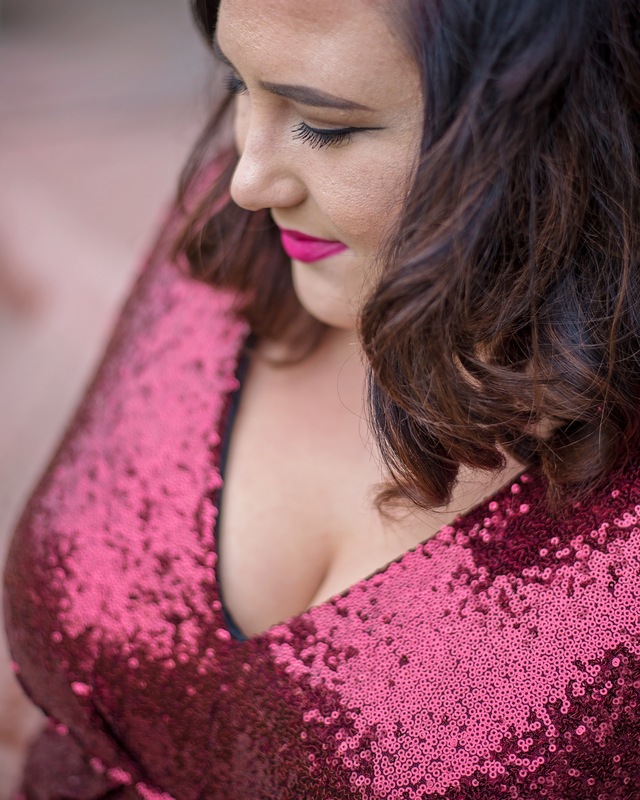 This dress is perfect for a New Years Eve party, or just a party in general. Some of you may think that this is a lot of sequins, and you are probably right. Two years ago if you would of told me that I would be wearing this dress, I probably would of laughed in your face. It’s a good thing that my outlook on fashion has changed. I’m not afraid to stand out, you shouldn’t be either. I live to sparkle and shine, and I won’t let anything stop me from doing so. I would like to give a special thanks to Trina for collaborating with me on this post. You are seriously amazing and I love you so much. 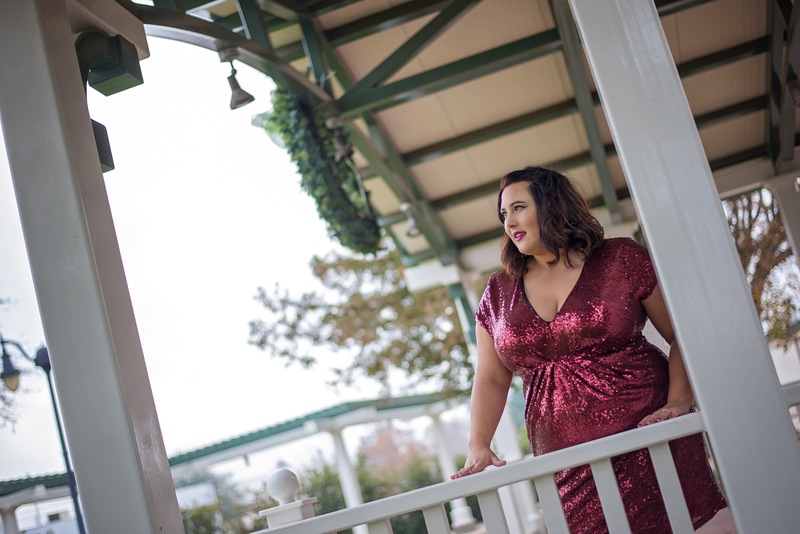 This gorgeous dress is from Charlotte Russe, if you didn’t already know, they have a plus size section. I am so in love with all of their clothes, they have a great price range and they fit! My dream is to one day become a model for Charlotte Russe, seriously. What a dream come true right? Imagine becoming a model for your favorite clothing store. ugh…I can see the cameras flashing now. Charlotte Russe, if you are reading this, I am interested! I don’t know if you can tell. 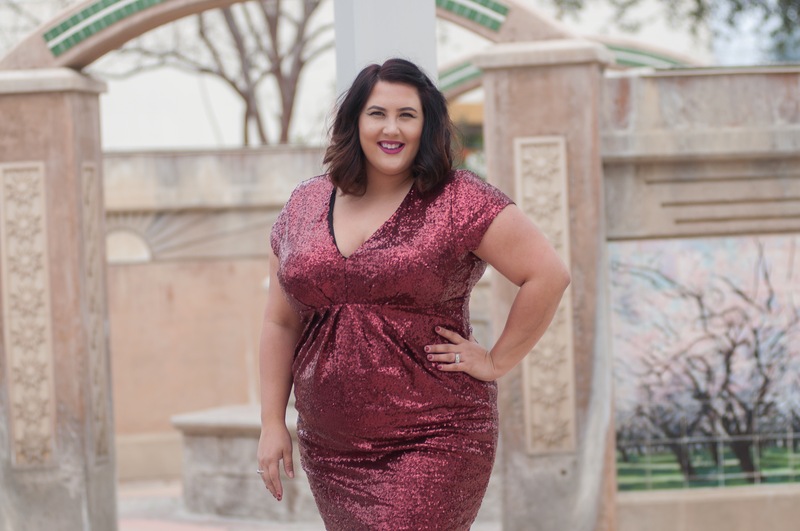 This dress is the “Plus Size Sequin V-Neck Bodycon Dress”. Originally $42.99 and now on sale for $30.09. There is also a gold and a silver color. I personally love the maroon better. I love the way that this dress just compliments my curves, it’s not too tight, but tight in all of the right places. My tights are from Torrid and my booties are from Charlotte Russe. I would like to thank Trina once again. I love you so much! She is an amazing photographer, you can check out her work here!